Xiaomi's MIUI has been one of the primary driving forces behind the success of the company's smartphones. You can argue that the company, which has convincingly proven that "you can pack in some real neat hardware, yet somehow keep your devices budget-friendly" still has a lot more going for itself. That is true, but you see, the user interface is key to a device's ease of use and functionality aspects, and being an OEM you simply can't ignore it. Look what that it did to Samsung: it now has little choice but to start reworking on its TouchWiz UI for its future phones, including its next flagship simply because it was awful on so many levels. Xiaomi's MIUI sticks closely to its Chinese roots and quite obviously doesn't shy away from being a show-off in terms of look and feel. Flashy icons and animations therefore come as a part and parcel along with this UI. But what makes Xiaomi's MIUI different from other Chinese counterparts, or UIs in general, is how well integrated it is over the Android OS. The result being, you get a good looking, slick UI that is as functional. It's as smooth as HTC's Sense UI, only that the MIUI is much better looking. Xiaomi has been often criticized for 'heavily skinning' Android to a level where the very soul of Android software seems left behind by miles. 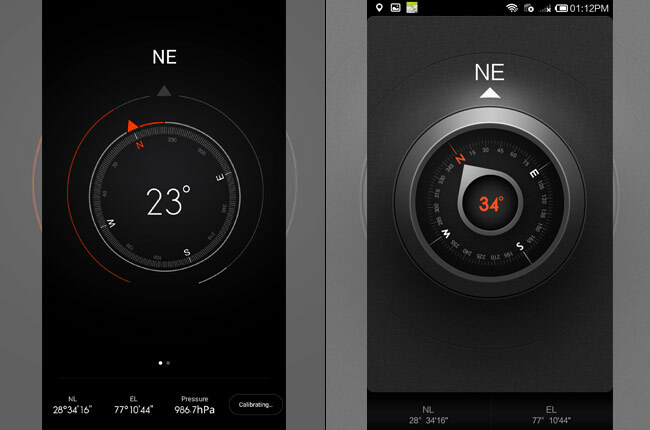 In the version 6 the company has been accused of blatantly copying Apple's iOS 7. Both these accusations are true to some extent, and shall depend on how you decide to look at the MIUI. At the end of the day, it's all about customer satisfaction, and rest assured they are not complaining. A mixed bag wherein you get the functionality of Android (plus additional themes support) with the style and sophistication of iOS is not a bad deal. Of course, Apple fan boys and stock Android lovers will beg to disagree. 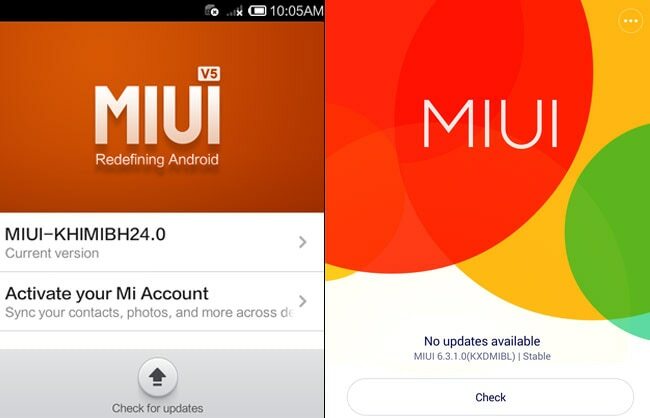 While the MIUI 5 was based on Android 4.2 (all the way up to 4.4.2), the MIUI 6 is based on Android 4.4.4. The MIUI 6 is flat all the way down to the core (including icons, buttons as well as bundled apps) and comes with a new animations set as compared to its predecessor. It is certainly way better looking than MIUI 5. The UI appears better-looking than stock Android KitKat, however, Lollipop is a clear winner in terms of overall look and feel. 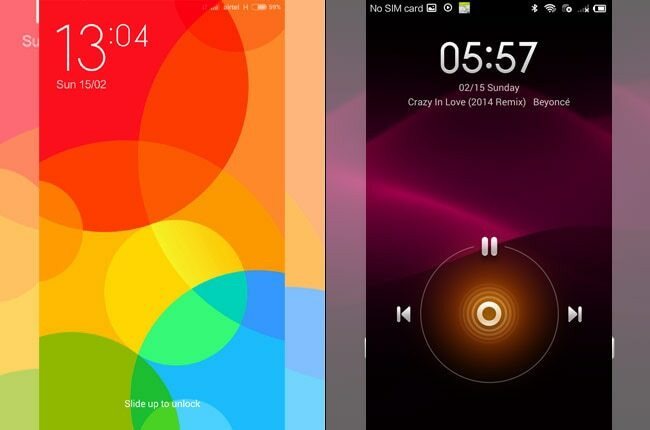 And yes, the MIUI 6 will remind you of iOS 7 on more than one count. Xiaomi has greatly simplified the lock screen and done away with the circle toggle that was used to drag around to access basic features in MIUI 5. Instead of having to pull down on the circle, you can just swipe up to unlock the device in MIUI 6. The simplicity however comes at a price, in that the lock screen is no longer as dynamic as it was in MIUI 5. There is no longer an option to add widgets to the lock screen. Unread notifications do however show up on the lower end of the screen, and tapping on it leads you straight to the concerned app. Swiping left across the lock screen in MIUI 6 will take you to the camera app much like in the case of Lollipop. 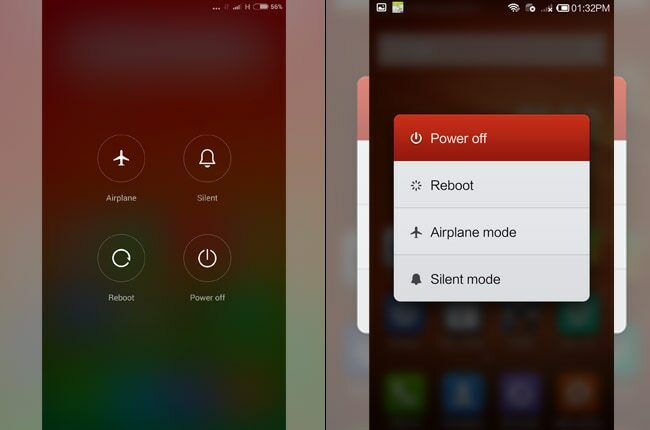 There's a major overhaul in terms of the notification panel in MIUI 6. To begin with, it has a complete turnaround with respect to look and feel: it now comes with a transparent/blurry background that reflects whatever app/screen is behind the panel. Yes, it looks a hell lot similar to the notification panel found in iOS 7. You can, of course, quickly swipe between notifications list and the quick settings like before, but you can no longer reorganize items in the quick settings panel in MIUI 6. The recent app switcher builds upon the previous icon view found in MIUI 5, and adds a card view to it, much like the one we see in iOS 7. You therefore get two ways to view your recent apps: the traditional icon view and a card-based view. Switching between the two needs a mere pinching in and out. The MIUI 6 also says goodbye to the traditional Menu found on the MIUI 5. This means the recent tasks button will take you straight to the app switcher, unlike before when you had to tap and hold the same to access it. The MIUI 6 comes with a completely redesigned settings app, which we feel is not the best when you're out using it. The sheer number of settings all thrown up on one screen can be overwhelming to many. 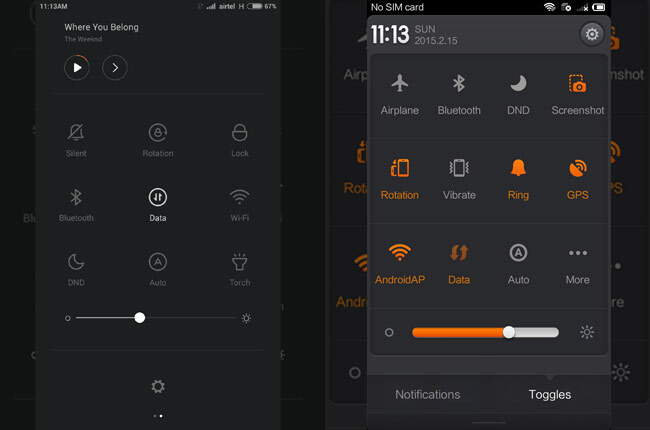 It does come with a revamped set of toggles that is pleasing to the eye; however, we personally think the settings app of the MIUI 5 was way better in terms of organization. The MIUI 6 comes with a set of fancy animations on-board, and we were pretty impressed with what's on offer courtesy the power menu. 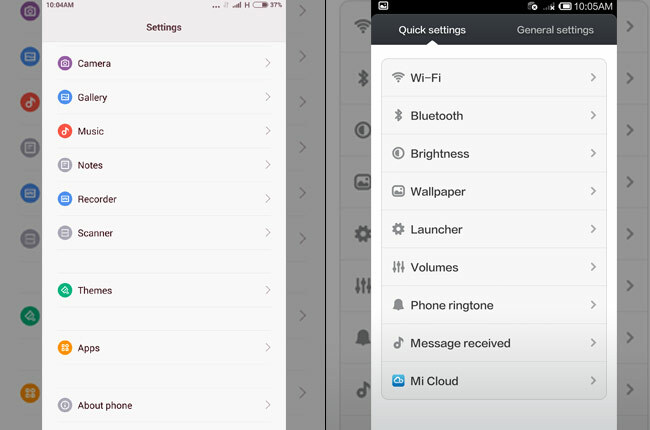 The power menu in comparison on the MIUI 5 was downright plain and boring. The MIUI 6 comes with something called floating notifications, which is not entirely a new concept, but is a nice addition to the user interface. Similar to Lollipop's heads-up notification, MIUI 6's floating notifications appear as small pop-up alerts at the top of the screen, giving you the option to interact directly to the same without having to open the notification drop-down menu. The pop-up alerts don't take up much screen space and won't take you away from whatever you're doing at the moment unless you decide to pick that call/reply to a text etc. While every app has received a fresh coat of paint in the MIUI 6, the following deserve a special mention for the sheer dramatic overhaul in comparison to MIUI 5. It must be noted that much of these changes narrow down towards the overall look and feel factor instead of majorly effecting the functionality aspect with respect to the MIUI 5. 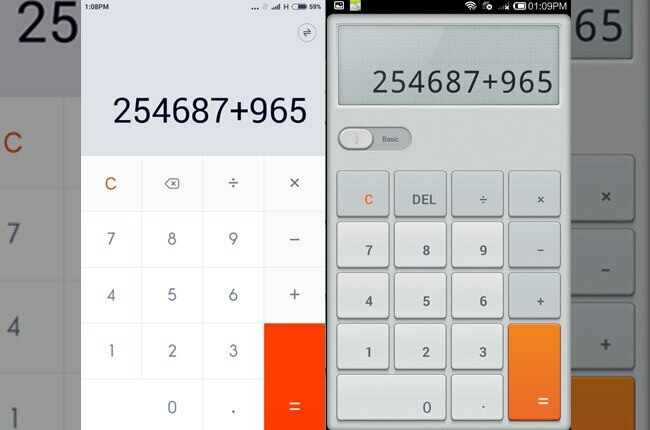 -- Calculator: The calculator app has been redesigned to feature flatter and modern looking buttons in the MIUI 6. Still, the app maintains its simple outline and background aspects. 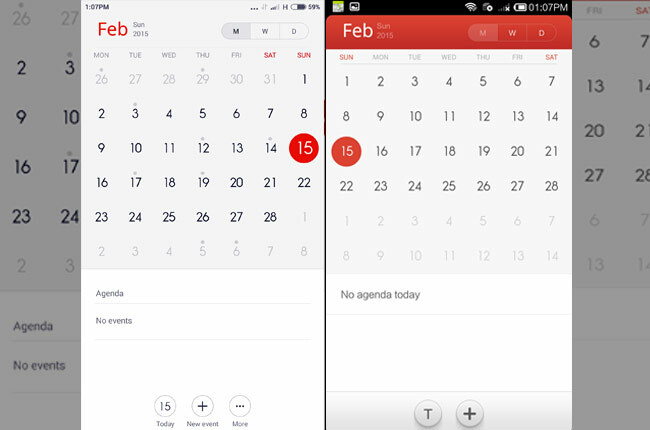 -- Calendar: The calendar app in the MIUI 6 seems to be now one step closer to iOS 7 in terms of look and feel. It appears to be the closest copy of the equivalent app on the iOS 7. Absence of a Menu in the MIUI 6 means, you get all your options (like jump to date and settings) right within the app on the screen itself. 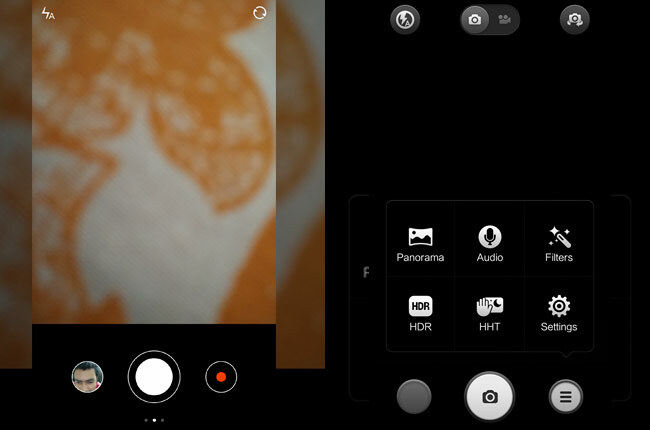 -- Camera: The camera app has perhaps received the biggest overhaul in the MIUI 6. Xiaomi has tried to simplify the camera app to an extent by reducing the number of screen toggles here. As a result, the gallery toggle, the camera and the video recording toggles have been arranged together at the lower end in the form of circles. Switching between the camera and the video toggles changes the frame to include a three screen and a two screen display accordingly. Therefore, instead of giving a separate toggle for filters and modes, the MIUI 6 now gives you separate screens for it, which is nice and less confusing. The video toggle will remind you of the iOS, in that the circle icon while recording turns into a square. 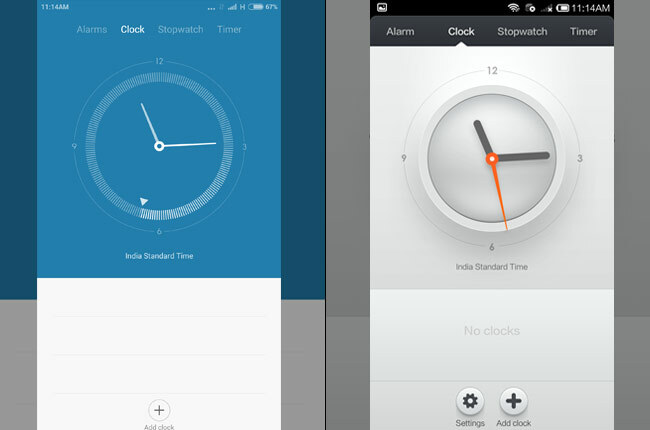 -- Clock and Compass: Both the clock and compass apps have received an arguably good looking update in the MIUI 6. The clock app in particular looks really good, and the fact that it is animated makes it all the more pleasing. In addition, subtle changes to the gallery, dialler, messaging, music and video, browser and email make the MIUI 6 a thorough update to the MIUI 5. 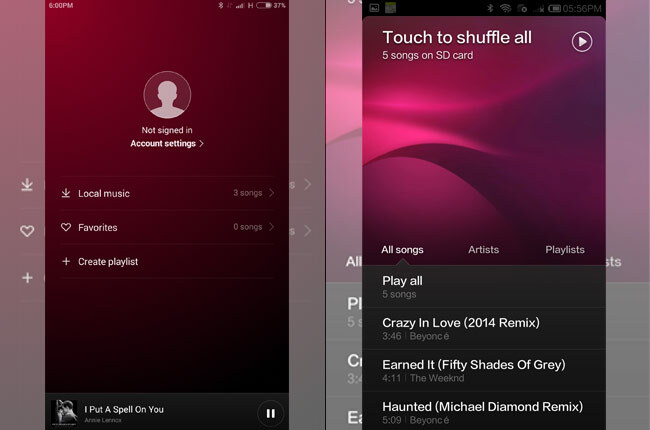 The MIUI 6 is what you call a major design overhaul in comparison to the MIUI 5. Features like floating notifications, a card view in app switching and redesigned apps, particularly the camera help a great deal in improving the UI in terms of functionality. But overall, it's about the look and feel aspect with this one, and let's just say it doesn't disappoint. While some of it may have been borrowed straight out of Apple's textbook, you cannot call the MIUI 6 as a total rip off, as some allege. It's definitely a handy improvement over the MIUI 5, but we feel, Lollipop still has an edge and is definitely a better looking one too.